Winter Kill & Trophy Trout … who woulda thunk it! It’s easy to understand how the term “winter kill” could be perceived negatively by many angling enthusiasts. Once we understand what it is and how it typically influences our small, productive waters, however, we might be surprised to learn that as often as it can detract from angling experiences, it can augment them. It can actually create some rather spectacular quality fishing opportunities. 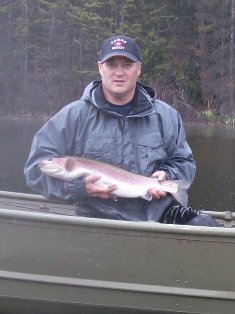 Winter kill & trophy trout? Like all waterbodies, the small lakes of British Columbia experience seasonal biochemical and biophysical processes which affect the resident biota. Translation: a lot of stuff, most of which you can’t easily observe with just your eyes, happens in our local lakes, and it affects the critters that live there. 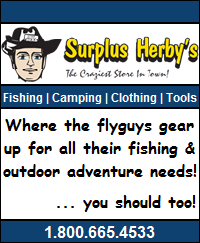 Although lakes vary in the relative diversity of fauna (critters), for the purposes of this article, we’ll limit “critters” to the fish we seek and the insects they seek. Lakes are also diverse in physical shape (and therefor volume), geographical location, and water chemistry as well. Depending on these factors, they will freeze, thaw, and “turn over” at different times. There’s a lot of information out there on turnover, which is the phenomenon that occurs when a lake goes isothermal (same temperature throughout the water column). And, when water is all the same temperature, it’s also all the same density, which basically makes it easy for forces like wind to mix up the whole cocktail and allow for the oxygen in the air to be dissolved into the water. That is a very important process because oxygen is as important to fish as it is to you and I. Turnover happens twice a year in most small BC lakes, and it’s the fall turnover that infuses oxygen into lakes, enabling our beloved fishy friends to respire (breathe), and therefore survive, over winter. Now that would be a happy ending if all the fish lived happily ever after in their well oxygenated habitats, season after season. Well, if you’ve experienced the results of too many jalapenos in your tacos, you know this world can be a cruel place. The fish don’t always get spared either. Sometimes, the oxygen levels under the ice will drop below what is needed to sustain fish. 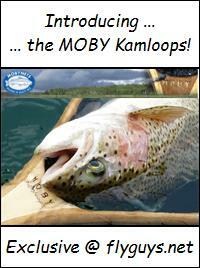 When that happens our fishy friends kick the proverbial bucket. This phenomenon is commonly called, “winterkill”. 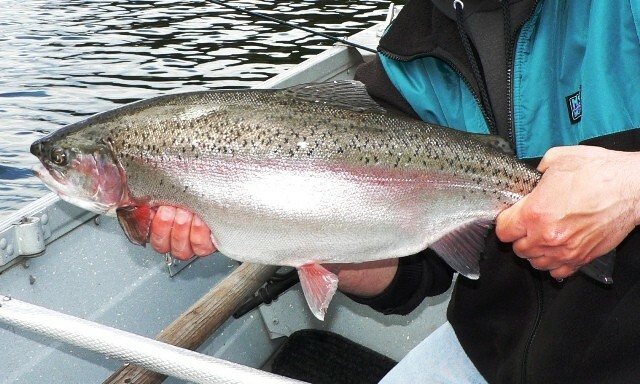 Winter kill is actually routine in certain BC waters, while in others it occurs infrequently. In many large, deep lakes, however, it never occurs. The profile of lakes which are prone to winterkill share some similarities in that they’re typically (relatively) shallow, highly productive, and lack significant freshwater inputs (inlets or groundwater seepage) supplying oxygenated water during winter. Productive lakes tend to grow a lot of macrophytes (aquatic plants), and like all plants, macrophytes need light to survive. When enough ice and snow cover a lake, the macrophytes cease photosynthesizing (producing their own food), starting from those in the deepest water and progressing to those in shallow water as less and less light is able to penetrate the increasing snow and ice above. When those starving plants die and rot, the decomposition process consumes oxygen dissolved in the water. 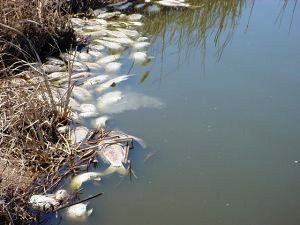 The cumulative oxygen demand from biochemical processes (like decomposition) and biological processes (like faunal respiration – critters breathing) is what causes oxygen in the water to be removed from what is available to sustain fish. Now before you go calling me a pisci-sadist pagan fish-death celebrator, hold on! I don’t love the fact that fish suffocate to death, but in terms of angling opportunities, there’s a trade-off between the negative aspects of winter kill and “trophy” trout. … the product of a winter kill enhanced diet! When a lake winterkills, the invertebrates that were constantly being picked off by feeding fish are left unmolested. Some invertebrates are prolific breeders and will build to incredible densities very quickly in the absence of predation by fish. When such lakes are subsequently restocked, not only have invertebrate densities had a chance to increase, but there is often only one cohort (group stocked at the same time) of fish eating those bugs! In the absence of the level of competition that would exist if there were fewer bugs and more cohorts of fish, the inhabitants grow at increased rates. A lake that has experienced significant mortality to an oxygen depletion event may nonetheless continue to support a population of fish that has survived that same event. In fact, on most years, the number of lakes which would be subject to absolute or total kill events is arguably outnumbered by the number of lakes that suffer partial events. Keeping in mind that “partial” is a spectrum ranging from almost all to almost none, it is easy to understand why partial kills are prevalent. And, not only do these events improve fish growth, they most often result in reduced angling pressure too. … another beneficiary of the insect rich winter kill & trophy trout scenario! Word tends to spread quickly about what lakes have experienced significant kill events. In addition to anecdotal reports from anglers (which are subject to varying degrees of reliability), local Provincial Fisheries sections often conduct their own testing and reporting. Today’s social media is not only an effective way to sabotage your ex-lover, but also an effective conduit by which results of lake testing and informal observations end up filtering to the angling community. Daunted by the prospect of driving to a lake merely to sing country songs, people tend to avoid lakes that have incurred indeterminate fish mortality from winterkill. Consequently, lakes that have experienced these events can be more “dead” in the parking lot than under the surface. Having such lakes on your “hit-list” is a good strategy for catching ones that end up having a mix of partial kills, relatively good survivorship (potentially BIG fish), and scant crowds. … a winter kill survivor hooked one year after a reported “total” kill! So, where might one witness such phenomena? The Roche Lake Provincial Park and surrounding area is one in which holds a large number of productive stillwaters, and provides a variety of angling opportunities from “trophy” style fisheries to family oriented ones. Interestingly, the type of fishery provided by the various lakes is not static, but rather, varies in accordance with the history and extent of winterkill events. Although every lake in the area is a realistic candidate for producing fish to 2kg (or larger) under the right conditions, almost never will they all be producing fish of that caliber. Most of the time, some lakes will hold high numbers of smaller (in a relative context) fish because of either continuous stretches of good survivorship (and hence high competition for food), or not enough time having elapsed since the last kill event (young fish). Lakes that tend to have frequent and repeated severe kills can benefit by having successive years of at least partial survival. Bleeker, Tulip, Bog, John Frank and Frisken are all good examples of lakes that can have outstanding fishing for larger fish after only a few years of survivable winters. Conversely, lakes with relative abundances of moderately sized fish can be positively influenced by one or more successive partial kill events. Scuitto or Campbell Lakes might be such examples. Roche Lake, the largest in the area and one that was not traditionally considered a winterkill candidate, suffered a partial kill over the winter of 2013/2014. The Roche lake winter kill makes an interesting case study. 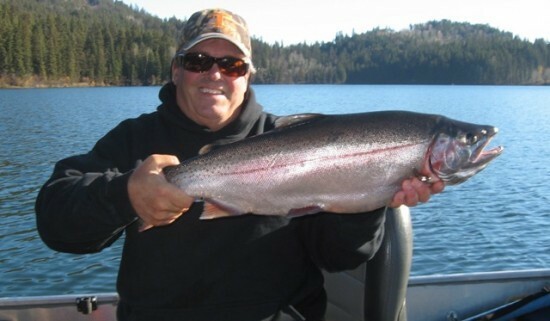 … a Roche lake area winter kill & trophy trout success story! 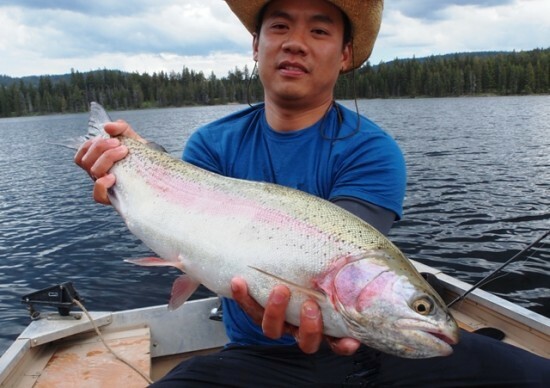 Rather than restate the voluminous information available on Roche Lake, I’ll summarize that the lake, stocked exclusively with rainbow trout, can produce fish to 5kg and holds good numbers of fish in the 1-3kg class. 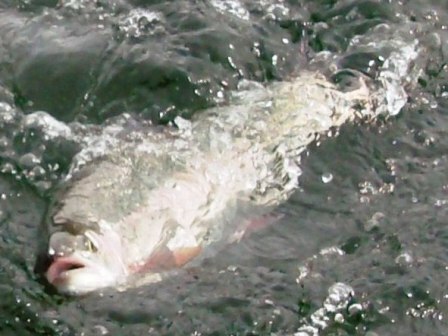 Fish size, until spring of 2014, had not been influenced by winterkill, but rather, had entirely been a product of sound fishery management by Provincial officials. Although the lake occasionally produces fish on the larger end of the previously described spectrum (eg. 3kg), it was reasonable to say that fish in the 1-2kg classes made up the bulk of what was being caught leading up to spring of 2014. The winterkill late in the winter of 2014 has influenced the lake’s fish population and age structure. Mortality estimates seem to vary, but local fisheries managers were speculatively using figures close to 20%. Word amongst many routine visitors, however, was that the fishing was notably slower than one might expect even if the lake would have lost a fifth of its fish population. These reports likely contributed to the reduced angler pressure observed over the open water season of 2014. By late autumn, however, many of those undaunted by the spring’s poor reports had experienced results that would be impressive by most standards, both in relation to abundance and size! Reportedly, the increase in fish size is readily apparent, and the relative prevalence of fish in the 2-3kg size classes was also notable compared to other years. Above water, boat traffic was limited and quality real estate was abundant. 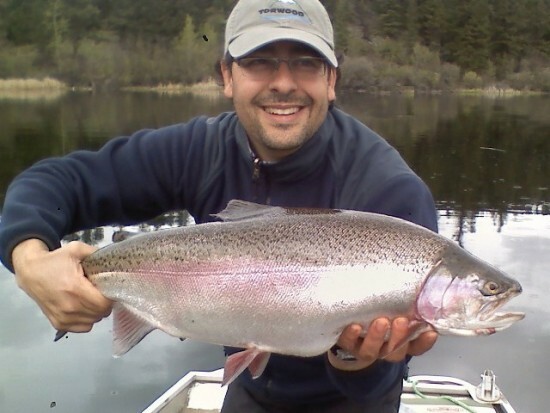 Winterkill events are rare at Roche Lake, and indications are that spring 2015 should provide some very good angling opportunities. To minimize the time it will take to re-establish fish densities similar to those existing before the 2014 kill event, local fisheries managers had the BC Freshwater Fisheries Society stock an additional component of fish, including 2000 “catchable” Fraser Valley strain 3N (triploid) rainbow trout. These catchables were stocked at an average fish size of approximately 250g, which is approximately 25 times larger than the yearling trout that are routinely stocked. Fisheries managers will often do an initial stocking of catchables after kill events to “kick start” the lake’s recovery in terms of producing larger fish, given that they often attain weights of over 1.5kg within their first open water season in highly productive waters such as Roche. These catchables will add to the likelihood that even in the short term, Roche Lake will continue to produce some very nice sized fish. Even as the fish age and size structure begins to resemble what it was previous to 2014, survivors of that year’s winterkill will be pleasantly surprising anglers for a few years to come! 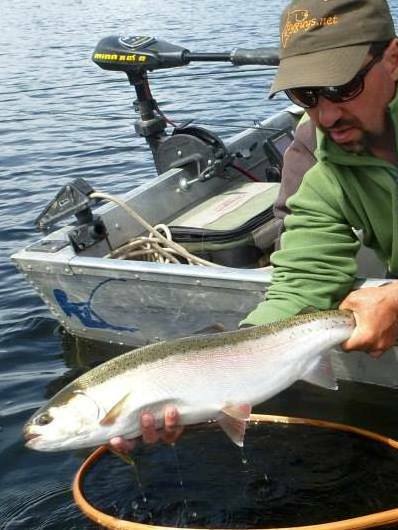 Aside from the immediate opportunities expected at Roche Lake, anglers should consider the potential offered by other area lakes. Roche Lake can serve as a good base camp for exploring these nearby lakes, and it is likely that the folks at Roche Lake Resort will be able to afford their guests invaluable local intelligence on what is “interesting” at the time. Keep in mind that to keep all the area lakes available as options, a 4WD vehicle with adequate clearance and recovery gear are must-haves. Whether in the Roche Lake area or elsewhere, there are benefits to keeping tabs on winterkill lakes and targeting them in subsequent years. Lakes are seldom completely killed, and even if the remaining density is low enough that you’d be unlikely to want to fish it in the season following a kill, the surviving cohort will add an interesting, reel-screaming element to following years’ potential at those waters. If you are coming from out of town, just be sure to have a back-up plan so that your fishing holiday doesn’t become a time when you would have rather stayed home and done doggy-doo patrol in your neighborhood park. Angling at lakes which have suffered winter mortality can be a test of patience and skill, but those willing to seek these waters and put in time are often rewarded. 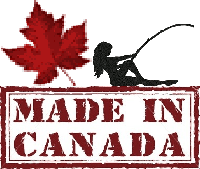 This entry was posted in Still Water Fly Fishing and tagged Bleeker, Bog, Campbell, Frisken, John Frank, Roche, Roche lake, Roche lake winter kill, Roche lake winterkill, Rose, Scuitto, Tulip, Winter Kill, Winterkill. Bookmark the permalink. I wanted to thank Benny for his write up on winter kill, and the “full-circle” of the lead-up and outcome of these events. It’s a topic that is talked about a lot, but not thoroughly understood that’s for sure! 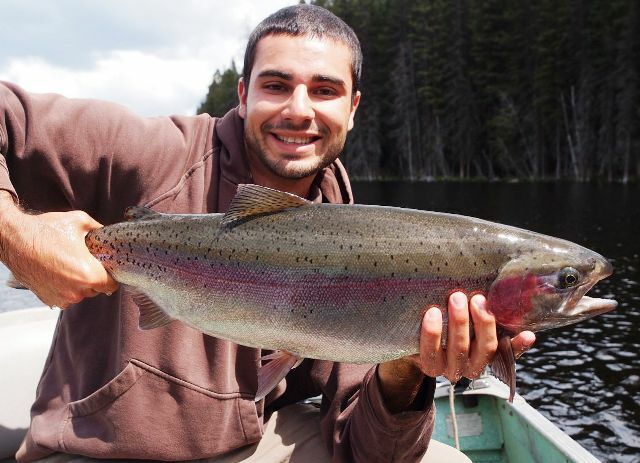 Roche Lake was avoided by a lot of anglers last year, and I am one person who is really looking forward to the upcoming “recovery” fishing that should occur in 2015. In the fall of 2013 I had the opportunity to stay at the resort and it was a great weekend for us. The restaurant overlooking the lake was awesome, and the people at the resort were very friendly and accommodating. We will be back this year for sure! Thanks again Benny for posting a great write-up.